Lin Charlston: "An interdisciplinary approach is essential to my artist's books which are informed by my background in science research and education and an ongoing study of scientists’ notebooks. I place scientific method – observing, measuring, recording, hypothesising – into new, sometimes subversive contexts. Recent work delves into the complex relationship between plants and people. I like my books to be handled and provide opportunities for layers of discovery within the folds." Ludlow, Shropshire, UK: Charlston Books, 2016. Edition of 100. 10.25 x 8.25"; 50 pages. Printed digitally on Conqueror carbon neutral paper 160 gsm. Wire bound codex with hand embroidered cover. Signed and numbered by the artist. Lin Charlston: "Walking is the only way to encounter illicit plants which cling to walls and emerge from cracks and crevices in a city. During 2015 I made numerous walking ‘dérives’ in the city of Manchester UK, tuning-in to all things plant. The psycho-geographic method known as a ‘dérive’ is a ‘randomly motivated walk’ in which the role of chance is important. It is not aimless, more a sense of being drawn in to discover ‘unities of ambience, currents and vortices in urban terrains’ (Guy Debord 1958). 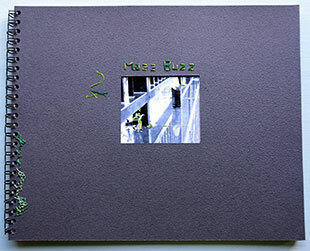 "Moss Buzz: 22 walks to the same place is a story of a cushion of moss which attracted my attention. Growing on a wall at the base of iron railings, it was so bright and fresh compared with the grey streets. The reader can share my fascination throughout a year of walking visits as the moss changes from vivid green to crumbling brown and back again. One year on, as I marvel at the endurance of this tentative plant life, the developers move in, the moss is swept away, and the railings are boarded up." Ludlow, Shropshire, UK: Charlston Books, 2012. Second edition of 50. 8.5 x 8.25"; 14 leaves. Letterpress and digital printing. Comb binding. Lin Charlston: "A proportional analysis of Jorge Luis Borges' narrative The Library of Babel." 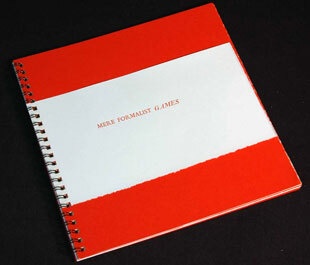 Lin Charlston 2001, title page: "Mere Formalist Games has been generated by counting and sorting the letters and words of an English translation of Jorge Luis Borges' short narrative. It has everything and nothing to do with Borges" meaning." Lin Charlston, 2013, introduction: "I approached 'The Library of Babel' in the form of an imposter. I was a hypothetical scientist who would subject the words and letters to tested procedures of laborious separation and measurement, sorting and counting. "I expected to reach meaningless conclusions, and to pose false hypotheses. I expected to smile wryly at the scientist who has faith in such procedures 'Obviously, no one expects to discover anything.'" A key shows how the diagrams on each page were derived and printed. 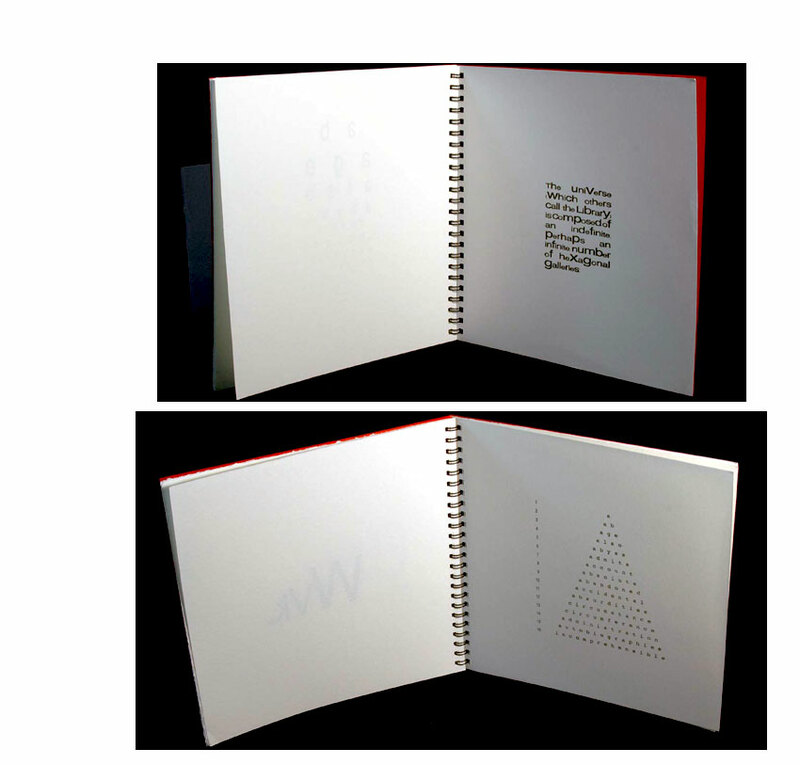 For example, the key to page 5: "The new alphabet is arranged by frequency of use. The letters appear in decreasing size from the most frequently used 'e' downwards." Ludlow, Shropshire, UK: Charlston Books, 2012. Open Edition. 3 x 4"; 16 pages. Digitally printed with archival inks on Hahnemühle Photo Rag Duo paper. Line-drawings. Hand bound codex with translucent dust wrapper. 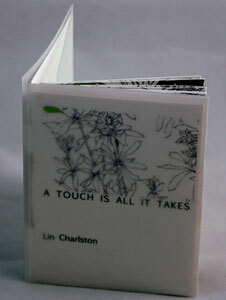 Lin Charlston: "A touch is all it takes continues my interest in the complex relationship between plants and humans. "In 2012, I completed an Open University course 'Plants and People' to update my understanding of plant science. The course team had taken care to present science as politically neutral while being aware of public concerns. Nevertheless, accounts stressing the importance of biodiversity strongly implied the damaging effects of mono-culture and intensive farming. "'A touch is all it takes' is a phrase used by Monsanto on their website for the weed killer, Roundup. 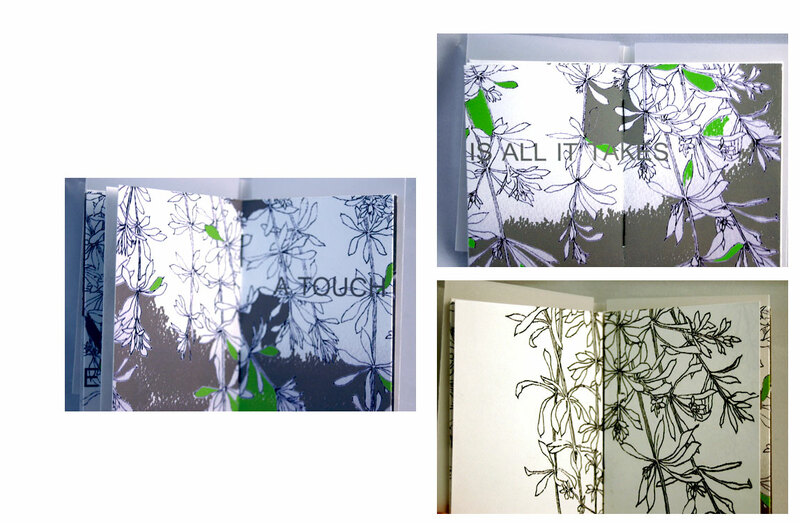 In the artist's book A touch is all it takes this phase is placed over detailed drawings of the weed Galium aparine [an edible and medicinal weed]. In the second half of the book, the drawings are inverted. "A slight pressure with one finger on the loose, translucent wrap makes the front cover clearer to read suggesting that it only takes a small move to start seeing things differently." Ludlow, Shropshire, UK: Charlston Books, 2011. Edition of 50. 10.5 x 6"; 28 pages. Hand stitched, digitally printed codex interleaved with tissue paper. Printed with archival pigment inks on Gerstaecker 125 gsm paper. Cover is Arches 250 gsm rag paper. Lin Charlston: "Fire destroyed the vegetation of a blanket bog in the Black Mountains of Wales and it has never grown back. The exposed peat is like a huge scar in the landscape and the peat is eroding away. 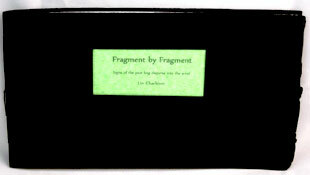 "In Fragment by Fragment, a peat bog disperses into the wind after a devastating fire. The story unfolds through my semi-legible font 'peatbog' in which sketches of hundreds of peat fragments have been transformed into an obscure written language." "Fragment by Fragment is one of four works shown at the exhibition Bog"Mawnog in 2011 in which six artist's responded to a damaged peat bog in the Black Mountains of Wales (mawnog is Welsh for peat bog). "The direction of my work was influenced by Jesper Hoffmeyer's 'Signs of Meaning' in the Universe. From the vastness of the unknowable, inhospitable bog I turned to its tiny fragments in the hope they would relinquish some meaning. I removed a small sample of peat and began to inspect, record, and classify the fragments. The drawings turned into written signs, a language almost as unknowable as the bog itself. "In the artist's book Fragment by Fragment, I have related the story of the decaying peat bog - the devastating fire which removed the vegetation and the exposed fragments blowing away in the wind - using my semi-legible font 'peatbog' which comprises letters based on drawings of peat fragments. The story is related through patterning on the page rather than through words. "The cover of rich black Arches paper represents the peat while glimpses of green tissue remind us of the vulnerable layer of vegetation which keeps the peat bog intact. The wide spread of the open book evokes the vast horizon." Ludlow, Shropshire, UK: Charlston Books, 2010. Second edition (open). 4.25 x 5.75"; 14 pages. Hand stitched pamphlet with fold-out cover. Digital prints of original sky photographs. 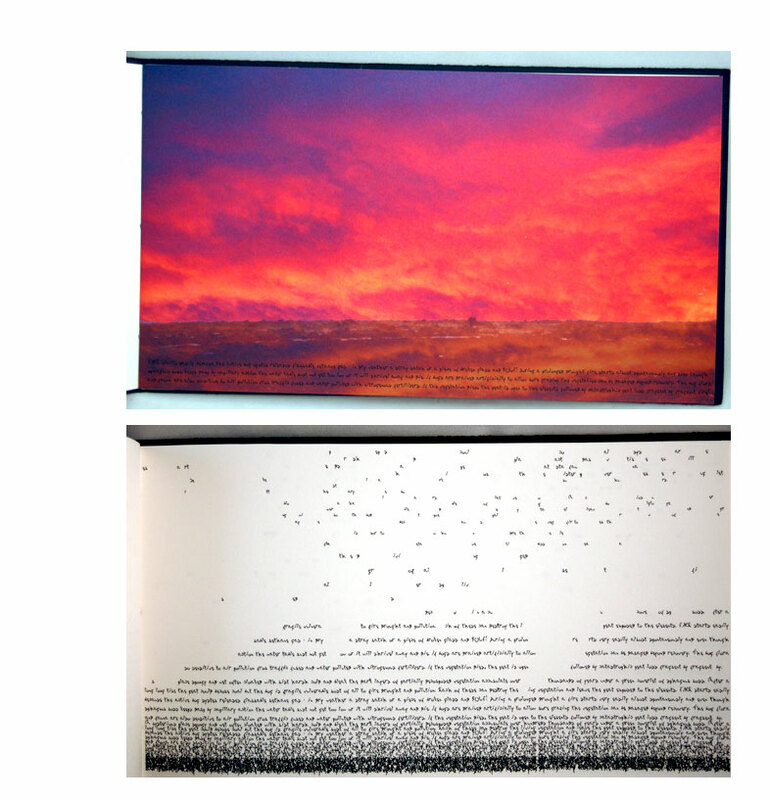 Lin Charlston: "Blue Sky Research is one of ten artist's books in my Chromosome 22 Collection, shown at Camberwell College of Arts MA Degree Show 'Strip' in 2000. The body of work was prompted by the announcement that the first human chromosome had been sequenced in December 1999. "I was particularly interested in motives for gain within goal orientated research and how the information was communicated to the public. "Blue sky research in science is not confined by practical aims or financial objectives. It is led by imagination and playful speculation allowing space for an intuitive leap. 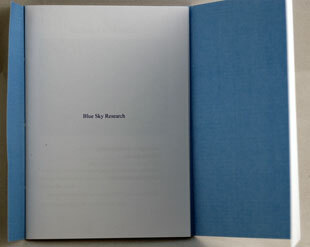 The artist's book Blue Sky Research starts with factual descriptions of cloud photographs. A metaphor in the text, 'cauliflower tops', sets off a train of thought that connects clouds with biological forms, thus mimicking blue-sky thinking. A parallel text comprises quotes from the Human Genome Project and science writers including Thomas Kuhn. "This small book exhibits features of more than one book style. The cut-away cover, peri-textual notes, and photographs taken over a period of time are characteristic of notebooks I have researched. 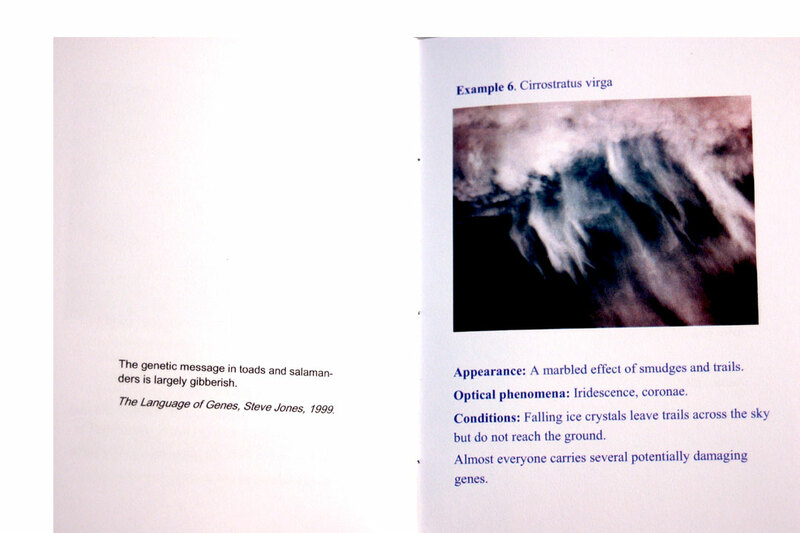 The pages have the format of the Little Gem series of nature handbooks. Finally, the thro-out back cover revealing an expanse of plain blue and the narrow fold at the front of the book reflecting blue onto the white page, identify the artist's book genre. "Descriptions of cloud formations gradually shift towards genetic interpretations. The side narrative highlights 'blue sky' research which allows for open-ended, creative thinking within scientific research." Ludlow, Shropshire, UK: Charlston Books, 2009. Edition of 50. 6.25 x 6.25 x 2" sculptural structure. Hand-cut Fabriano Pittura paper. Digitally printed. Floral doodles by hand. Housed in lidded box with title on cover. Numbered on title label. Lin Charlston: "Plants can make their own food. Plants can live without people. 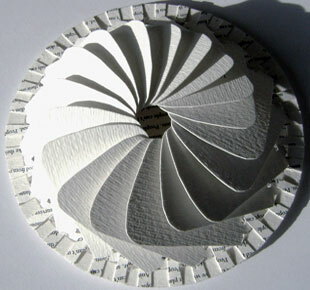 "As you turn the pages of this artist’s book you may be reminded of unfurling petals or leaves. The book when wide open looks like a flower - or a sun. Is there a connection? Yes, plants have been using energy from the sun to make food from CO2 and H2O for millions of years. The structure of the book is based on a vegetable steamer, which completes the cycle – plants make the food, we eat the plants.
" ... [P]rinted digitally with some floral doodles added by hand, on Fabriano Pittura paper. The swirl of pages unfurls like a plant. The open book resembles a flower – or sun." Ludlow, Shropshire, UK: Charlston Books, 2005. Edition of 250. 6 x 8.25"; 44 pages. Multi-section codex, hand stitched and folded. Printed offset litho on Eco Metaphor 150gsm paper. In matching dust wrapper. 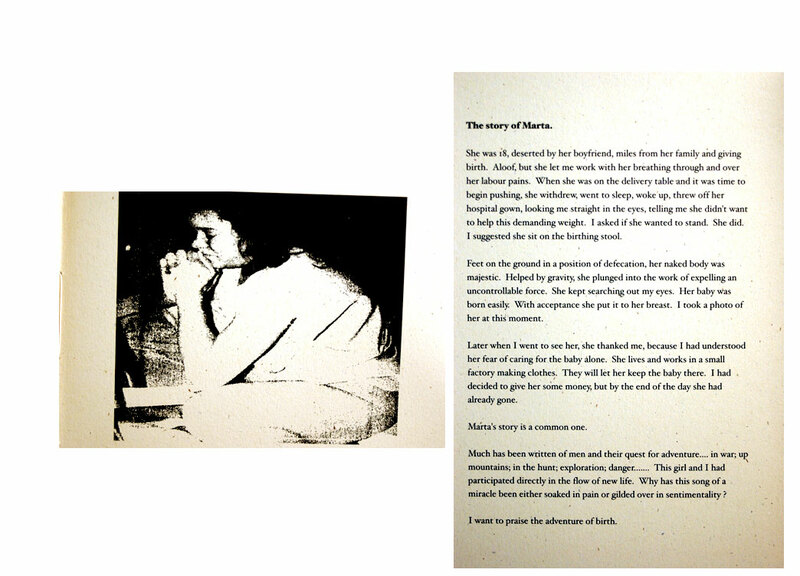 Lin Charlston: "An inter-subjective experience of natural childbirth. "My Body Creaked is one of five works shown at the Faction Exhibition Sense:Absence in 2005. "My approach to the theme Sense:Absence was provoked by Thomas Nagel's essay 'What is it Like to be a Bat', in which he discusses the subjective nature of experience. One of the works was an interactive sensory device in which participants were invited to imagine their arm as a bat wing. "My Body Creaked presents Carol Hughes' inter-subjective experiences of natural childbirth in South America which affected her almost as profoundly as her own experiences of childbirth. I have distorted her photographs in a way that accentuates the stark intimacy of heightened awareness while suggesting the incompleteness of a memory. The images are secreted in folds of the book."